Here's a “What am I?” quiz for the new year. Leave your guess in the comments; as with my other quizzes, I'll keep comments hidden until I reveal the answer in a few days. I think that is the jasmine dragon flower tea. If it is, that is the nicest I have seen yet. Sometimes, it doesn’t work like you expect. I’m still kicking myself for not taking a picture when a colleague demonstrated it. She had this nice tea set with a tiny bamboo mat as coaster and the neon light in our tiny break room surprisingly gave nearly perfect lighting where her cup stood. I should have dashed for the D3 waiting at my desk. 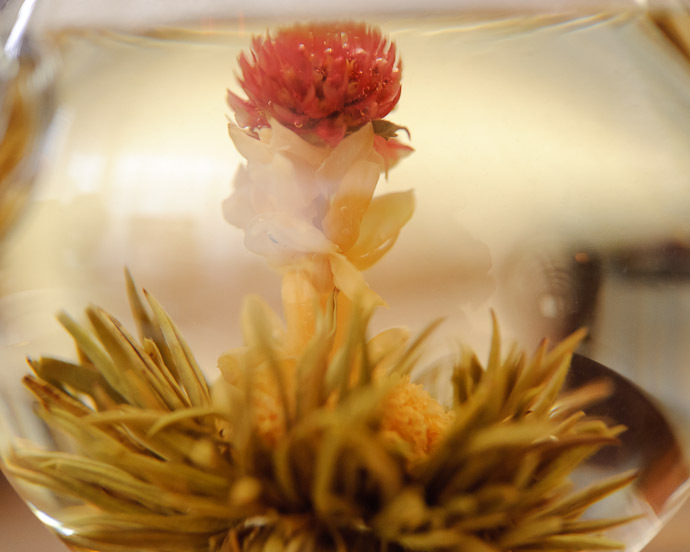 A flowering tea … dragon eye? A jasmine blooming flower tea. That looks like a Jasmin flower to me. Jasmin tea is highly popular in China as well. Looks like a thistle flower or Azami inside a glass bowl. I am writing this from Shanghai—and my guess is this is a photo of one of those fancy tea balls that blossom in the cup when hot water is poured over it. I have been remiss in thanking you for all the beautiful photos you post all year. Thanks to you, I’ve enjoyed Kyoto’s magnificent fall season of 2010. Anthony is really growing up but maintains his thoroughly adorable face. You and Fumie seem to be doing a really good job raising him. I hope you enjoy better health in 2011—your stress-related arm pains sound serious—please take it easy. BTW—the website I cited above is our homage to one of our lifetime’s greatest ballerinas, Nina Ananiashvili. I noted in one of your posts that Fumie likes ballet. I hope she has had a chance to see Nina during one of her frequent tours of Japan. Teaposy. Got a set for Christmas. The answer is mentioned on this post.